The temple city of Jageshwar has a cluster of 124 large and small stone temples, dating 9th to 13th century AD, including the Dandeshwar Temple, Chandi-ka-Temple, Jageshwar Temple, Kuber Temple, Mrityunjaya Temple, Nanda Devi or Nau Durga, Nava-grah temple, and Surya Temple. 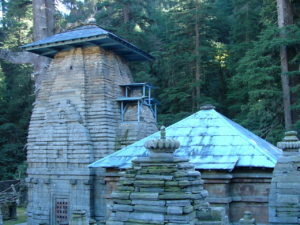 The Sri Mahamritunjaya Mahadev (महामृत्युंजय) temple is the largest and oldest temple in the Jageshwar temple complex. The unique shivlinga here has an eye shaped opening. Jageshwar is in Almora district, Uttarakhand. Some also believe Jageshwar to be the site of first of the twelve Jyotirlingas, Nageshvara Jyotirlinga.